We've put together this 3 step routine for the Weleda Almond range, ideal for sensitive or dry skin. An extra-mild, hypoallergenic and fragrance-free cleanser which gently removes impurities and makeup, while helping the skin maintain its natural balance. It is rich is essential fatty acids and vitamin E from the Sweet Almond Oil to nourish and calm the skin, reducing irritation and redness while it cleanses. Made with pure Sweet Almond Oil and the addition of Organic Blackthorn Blossom extract, this beautiful, fragrance-free, soothing and gentle facial oil helps to nourish and protect dry skin types and relieve skin irritations, including redness and the symptoms of mild dermatitis. This oil is suitable to use on its own under makeup, as an overnight hydrating treatment, or together with the Weleda Almond Oil range for sensitive skin. 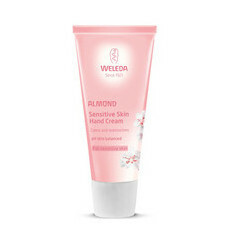 This rich cream by Weleda provides extra nourishment and protection for those with dry to very dry skin that is also sensitive. Fragrance free and created using mild Almond Oil and Plum Kernel Oil, the skin is left feeling supple and smooth and is protected against further drying. Made in Germany & Switzerland, NATRUE Certified Natural with Organic Ingredients, GMO & Cruelty Free, Certified Biodynamic & Fair Trade. mild scent and very creamy.